Atos, a global leader in digital transformation, today presents its advanced technologies for the soldiers of today and of tomorrow, who are becoming increasingly agile and connected. This is part of the Auxylium Battlefield Tactical Assessment Feedback Session which takes place at the French Ministry of the Armed Forces. The purpose of this tactical assessment was to test the performance and relevance of the functional benefits, brought about by 4G mobile when used by soldiers. For this, Atos integrated its Auxylium communication system into an ecosystem of mobile technologies and connected military objects. For Auxylium Battlefield, project leader Atos adapted Auxylium, the 4G communication, information, and command solution used by the French armed forces in internal operations and co-developed with the General Directorate for Armament (DGA), to enable interconnection with various partner solutions including those from Airbus DS, FN Herstal, RED Technologies, TCS, and Thales. The Auxylium Battlefield tactical assessment was conducted at Fréjus military base in South-East France, at the end of February 2018 under conditions close to those experienced in overseas operations. Soldiers put a range of innovations to the test in various combat sequences. Atos has developed a software suite that ensures a consistent flow of information between the various elements of the Auxylium ecosystem, the heart of which is the Auxylium Kit : a smartphone, PTT (Push To Talk) headphones and a Hélium case, which enables seamless connection to civil and military 4G mobile networks provided by several types of mobile bubbles. A new mobile command post model and civil or military connected objects have been integrated into the Auxylium services. Soldiers were able to test assault rifles with connected shot counters, drones which are capable of flying a pre-recorded path, tactile watches that can send an emergency call, and laser sight binoculars. Military operations can be orchestrated from a rugged tablet where the command can follow events and the location of the troops in real-time and give orders within moments. Among the most innovative services is the wireless communication system, which allows soldiers to continue communication via Auxylium in and out of infantry combat armored vehicles ("on-board and off-board"). A true communications hub on a dedicated military frequency, this solution provides a significant level of protection and is capable of penetrating any type of terrain. 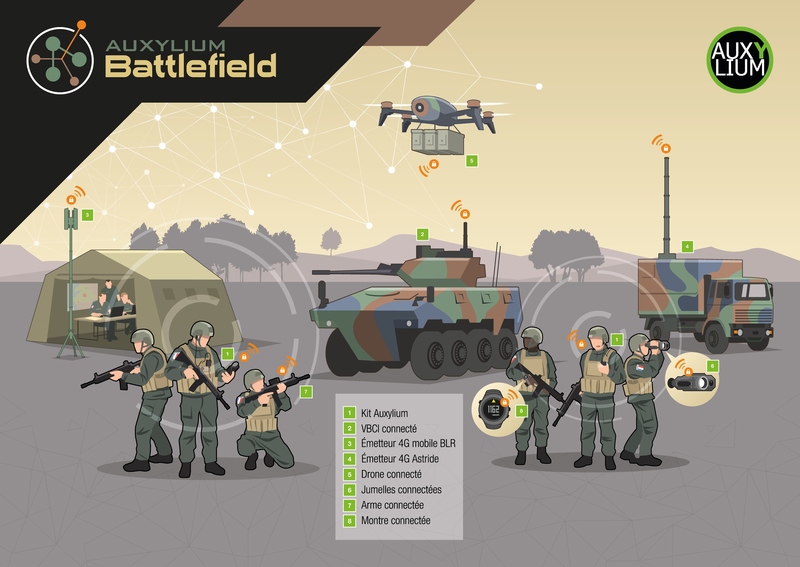 The tactical assessment demonstrated the relevance and effectiveness of all the equipment in the Auxylium ecosystem, which enables high mobility in the combat zone while reaping the benefits of military or civilian 4G networks. The Tactical Assessment Feedback Session, which takes place on March 29 at Hexagone Balard (French Ministry of the Armed Forces), is decisive for the future of technological developments in the military telecommunications field, in which Atos is fully involved. Atos is a global leader in digital transformation with approximately 100,000 employees in 73 countries and annual revenue of around € 13 billion. European number one in Big Data, Cybersecurity, High Performance Computing and Digital Workplace, the Group provides Cloud services, Infrastructure & Data Management, Business & Platform solutions, as well as transactional services through Worldline, the European leader in the payment industry. With its cutting-edge technologies, digital expertise and industry knowledge, Atos supports the digital transformation of its clients across various business sectors: Defense, Financial Services, Health, Manufacturing, Media, Energy & Utilities, Public sector, Retail, Telecommunications and Transportation. The Group is the Worldwide Information Technology Partner for the Olympic & Paralympic Games and operates under the brands Atos, Atos Consulting, Atos Worldgrid, Bull, Canopy, Unify and Worldline. Atos SE (Societas Europaea) is listed on the CAC40 Paris stock index.